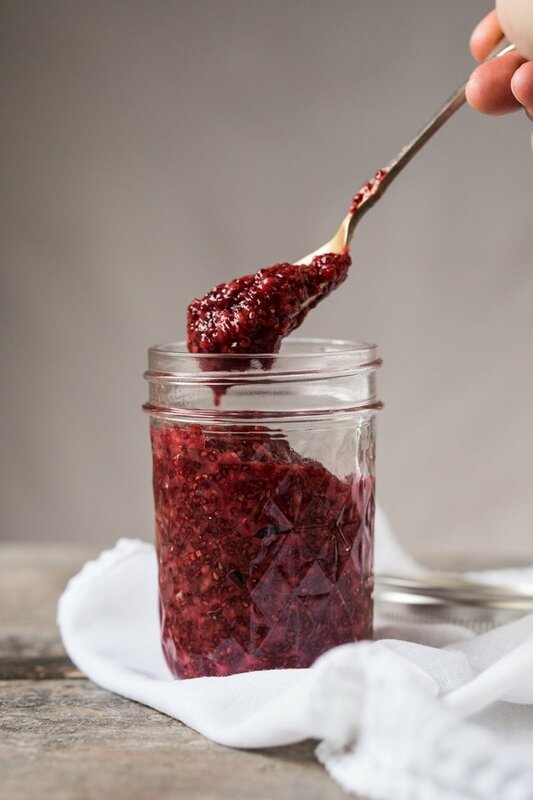 This paleo and keto chia jam is an awesome way of adding extra fiber and nutrients to your favorite berry jam! The chia seeds will add enough bulk that your berries will go the extra mile, making it a low carb ideal. With Your Berry Of Choice! 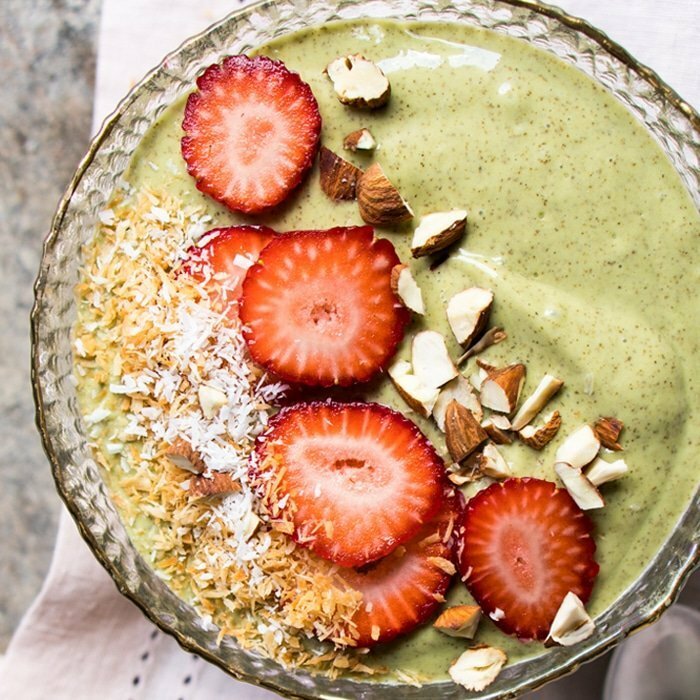 If you’ve already made our overnight chia pudding, then you know that chia seeds add a lot of bulk. 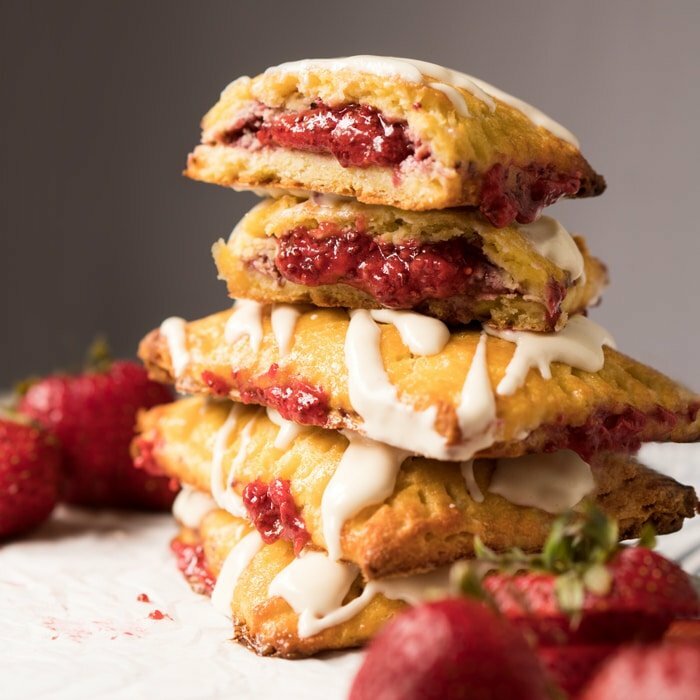 So they really are an awesome way of enjoying your berry jams without going carb crazy, as well as being super easy to whip up. 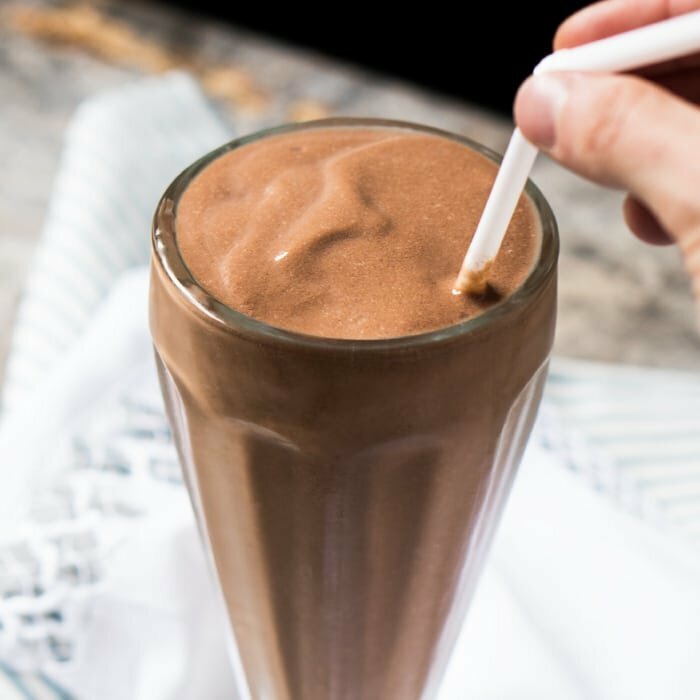 Think just 15 minutes and 1g net carb per serving. Chia seeds are awesome, and we’re crazy about them here at gnom-gnom. These tiny Mexican guys pack a whole lot of protein and add a whole lot of oomph. They contain large amounts of fiber and omega-3 fatty acids, plenty of high quality protein, and several essential minerals and antioxidants. 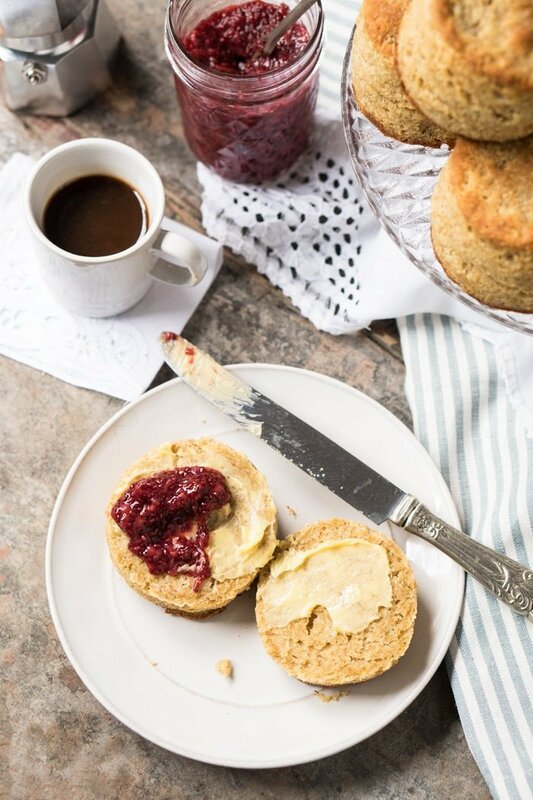 Oh, and this very berry chia jam is a seriously awesome pairing with our mile-high flakey biscuits! Cook your berries of choice (we love raspberries!) in a saucepan over medium heat until they begin to break down, about 5 minutes. We found this recipe to yield between 1 1/2 to 2 cups, depending on the desired thickness. Please note the following nutrition facts were estimated for a 1 1/2 cup yield and using raspberries. Have you tried this with ground seeds? If this can’t be canned, how long will the jam last? I was wondering if you thought I could can this recipe? I grow blueberries blackberry raspberries pears apples and I’d love to be able to make this recipe and have some for the winter months. This looks wonderful! I think I might try this with gelatin instead of the chia just because they always get hung up in my teeth :)) Thank you! Love, love your site. I have a recipe for Cherry Port Chicken that I love but have given up because of the Keto diet. 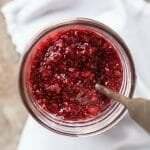 Do you think after making the jam I could use it in a sauce that requires cooking or would it break down? Hi Lynn! I’m sorry to have missed your comment earlier! In all honesty I’m not sure how well it will work… maybe you can try cooking the berries themselves for longer before adding the sugars so they reduce with their own natural sugars. Just made this jam using strawberries. YUMMY!!!!!! Can’t wait for it to cool down, i have a feeling it will be insanely delicious straight from the fridge. What i did was i added 1.5 Tbsp Swerve per two cups of chopped strawberries and i ground the chia seeds. The rest – exactly by the recipe. 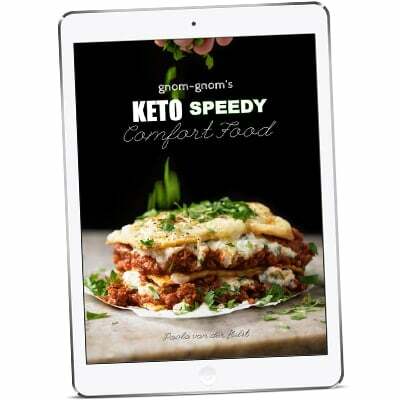 You have the Best KETO recipes on the web; you are my go to person! Yep! Another winner from Gnom-Gnom! Made a mixture of rasps and straws and it is divine! Now to make the toasted almond shortbread cookies to go with it. Thanks Paola! LOL! That’s great to hear Shona! And can I say I’m jealous of your imminent cookie situation?! xo! I made 1 Glass raspberry and 1 strawberry today. – I added 2 tablespoon´s lemon juice to the strawberries. Both turned out quite good. The strawberry got a little funny dark colour from the chia seeds, but the taste is fine. If you dont like the crispiness of the chia seed, you can just grind it and then add it to the jam. Chia seed jam … what a genious idea. Thank you Paola. Quick question, the nutrition facts say that its estimated out for 2 table spoons but the note right above says that it is for a cup and a half… I’m guessing it is the 2 table spoons for 3 carbs 1 net carb? Thanks! Hi Sarah! Nutrition facts are indeed for 2 TBS, and the 1 1/2 cup is the total yield. xo! Paolo you just blew my mind haha! 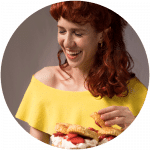 Were you thinking of using your donut recipe but shaped as balls with the chia jam inside? If so, I might try that this weekend as well! Paola, have you ever tried putting this inside your cookies recipe? Like a stuffed cookie. Just curious! Have been lookibg for a recipe for jam to go with the aebleskivers I made with the cburro batter and here it is. Have all ingredients on hand so making tonight and then freezing. I barely use other recipe blogs anymore you keep me so busy. Looking forward to trying those biscuits. I am enjoying the little rolls I made from my second batch of bread dough, taste better on second day, really enjoy the yeast flavor and they are quite filling. You must have a house full of people waiting to eat all your experiments! Guess what?! I ordered an aebleskivers pan after I saw your comment!! You’re definitely getting credit for that recipe idea Ellen! And yup on the bread! I’ve also noticed the taste to be better second day, and was honestly surprised by how well it keeps without going off after the first day (which is standard with most gluten free breads). Thanks so much for your thorough comments, they help me a bunch! Also apologies for replying to comments so slowly, I have tendinitis in both my wrists and recently had surgery on one so I’m struggling a bit to keep up with the blog right now :-S! Always read and appreciate every single comment though. xo!! Have you looked into dictation app so you don‘t have to type? Where can I find the recipe to the biscuits? Is it up yet? They look wonderful. Lol! Posting it in 20 mins ;)! xo!